The Junior Chess year runs in parallel with the school year beginning on the 1st September and most age limited competitions are based on the age on the preceding 1st September. At the end of the Chess year CNW have a celebration. This normally takes place during June, before the school summer holidays begin. All players who have represented the team during the year are invited - this means anyone who has played for the team or appeared as a selected reserve at any inter county competition (including official friendly matches). During the celebration, some chess playing normally takes place in the form of a Regional Competition and the day concludes with a prize ceremony where all players achievements are celebrated. When a players earns a total of 3 points in the season, they will be awarded the prestigious 'Wendy'. Like all the CNW trophies, it is named after one of the many adult helpers who make the running of the team possible. 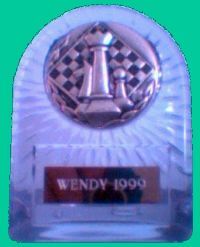 Wendy Plaisted actually donated an initial �25 many years ago from money she had earned by providing tea at the Frodsham Chess Congress and it was decided to use this money to buy trophies for outstanding play. The 3 points required to win this trophy was a considerable achievement in those days and winners were expected to be few and far between. The awards were however due to be made at the end of the first season that George Davison had agreed to take over the managing of the Cheshire and North Wales Junior teams. George made a major impact by producing an under 11 team which reached the under 11 EPSCA finals and also won the North West championships. Three points were therefore immediately achievable now and there became a need for a higher trophy to aim for. George then introduced the Brendy, named after Brenda Hibbs who ran the under 18 team at the time. If a players achieves 6 points in the season they will become eligible for a 'Brendy' instead of the 'Wendy' above. 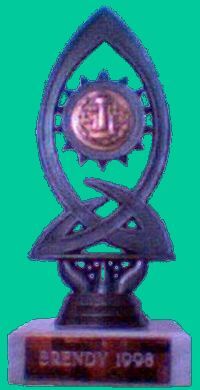 This was a sought after trophy which was rarely presented at the time and even now is only awarded in small numbers. As the team has improved and managed to qualify for entry into the finals, members have had more opportunity to gain wins. This has given the chance to a few exceptional juniors nowadays to even exceed this total, and for these George has finally introduced a trophy bearing his own name. 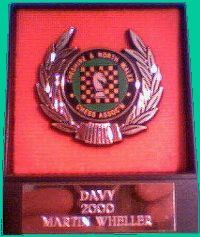 The 'Davy' is awarded for outstanding achievement during the season and only a small number will be awarded each year. The decision of whom receives the award is made by the team manager only and this award is the most prestigious of the season. The award is named after the present long standing team manager, George Davison and an example can be seen here.